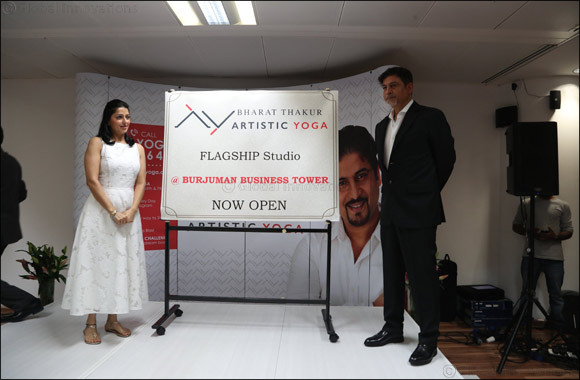 Dubai, UAE, November 05, 2018: Bharat Thakur Artistic Yoga expands its presence in Dubai; opens its flagship studio in Burjuman. It’s been an amazing and progressive journey for the Team BTAY since the inception of its first yoga studio in 1999. Known for its powerful combination of yoga techniques and modern exercises, Bharat Thakur Artistic Yoga plans to come up with new modes of yoga including a ground-breaking technique called Kaya Kalp, a 90 day programme that encompasses anti-ageing powers as well as pre-natal and post-natal yoga. Located in Burjuman Business Tower, BTAY’s special evening commenced with an exclusive Meditation session conducted by the Yoga Guru Dr. Bharat Thakur himself. More than 400 yoga practitioners attended the session which was a unique one hour long, intense and deeply healing one. The Yoga Guru took the jam packed audience into inner realms which would be transforming to say the least. Thereafter began the evening with exciting yoga contests, in which yoga enthusiasts from the audience took part. These activities were well-encouraged by the audience and witnessed the spirit of people who practice yoga each day.